In the edited version he predicts “Wednesday, Thursday”, in the original he predicts “Wednesday, Thursday, Friday”. Three out of the seven days of the week casts the net quite wide, particularly when no date is given. In the original version he says it will be near an airport or railway, but adds a caveat “these people, when they hear this [his prophecy], sometimes they change their strategy”. This detail is edited out of the final prophecy entirely. The attack was not near an airport, and not near a railway in any meaningful way (in fact Paris has many railways, so any attack in Paris could be claimed to be “near a Railway”), maybe Al-Qaeda are Emmanuel TV subscribers. Taken in its entirety, the prophecy serves no purpose. The attack still happened, there was no useful location or date, it happened months after the original prophecy. It’s one of many prophecies that would be quietly swept under the rug if nothing vaguely similar happens, but gets trumpeted from the rooftops when something matching its vague details does happen. See the original unedited prophecy below, thanks to our good friend and fellow TB Joshua Watcher Gary McGoff for posting. In our last post we exposed TB Joshua’s latest cut and paste prophecy where he claimed he predicted a bombing in America on a Monday, when in reality this vague prophecy was the result of three different, even vaguer prophecies which had been edited together to give us the impression it was more accurate than it was. Some readers may have thought our analysis was petty and nitpicking, but to do so would miss the motivation behind what we do. We’re not writing to mock a self-proclaimed prophet who’s “prophecies” really don’t stand up to scrutiny. No, we’re writing because we’re angry. We’re angry that someone representing Christianity is using a tragedy for self promotion. We’re angry that what he claims was a prophecy was useless for anything except giving him bragging rights. 8 people are dead. about 170 in hospital, many with amputations. They will spend the next few years with major psychological issues, and wont be able to think of anything else at night. Some wont be able to smell or handle raw meat. Others wont be able to stay calm after a balloon bursts. They’re right. TB Joshua has pulled it off again. Did TB Joshua predict the London riots? President Bingu Mutharika is dead, did TB Joshua predict it? Just a few hours later this video was released. Turns out our prophetic ability is better than we imagined. Sadly this is just more evidence that TB Joshua will shamelessly exploit a tragic situation for his own gain. Sadder still, he has an army of devotees who will lap up everything he says, gushing on their social media profiles about what a “true man of God” he is, without considering the substance of what he has actually said. American Homeland security should be tight, tight, tight. When you look at all those bullet points together, it’s not hard to see why people are impressed. The event in question did happen on a Monday, it was a bomb and it happened in a large gathering of people. Of course there is no date on TB Joshua’s video, so we don’t know how many Mondays have passed before this “prophecy” eventually became fulfilled, but credit where credit is due – a fair few facts were predicted. Or at least it would be, if he said all these points at the same time. Now we see that the two most accurate elements of this prophecy (a bombing happening on a Monday) were told in two totally separate prophecies. A bombing was predicted, but not on any particular day of the week. Given today’s tense political climate a bombing in America is sadly inevitable. A bombing happening in a large gathering of people is just stating the obvious. It was flames and “something roaming around” (no idea how that fits in!) that was predicted on a Monday. Predicting flames and a day of a week is vague enough that it will fit with many events. We’ve shown previously how TB Joshua edits out inaccuracies from his prophecies to make them seem more accurate than they really were. Here we see how he stitches together three different vague prophecies given at different times, that together seem reasonably accurate, but taken apart (as they were originally given) are so vague they could mean anything. Update: We have been criticised for omitting to mention that the third prophecy was supposedly related to the first and second prophecy, therefore they were not all separate as we implied. This is certainly the impression you are meant to get from the was the prophecy video is edited together, but really this just further emphasises the deception. In the third prophecy he says “you remember I said last week to pray for America”, then mentions three other occasions he’s said the same thing. They want to to believe that he is referring to the previous prophecy where he predicted flames on a Monday. This clearly isn’t really the case, because if it were the voice over would have said something like “on the following Sunday service he said…” rather than “…on another Sunday service he said…” and they would have given dates. If this link were established he would have at least predicted a bombing in America on a Monday – not much help to anyone, but something at least. Without this link established, all we’re left with is useless, vague titbits which need editing together before they begin to resemble anything like reality. Back in May, TB Joshua faced a huge dilemma. 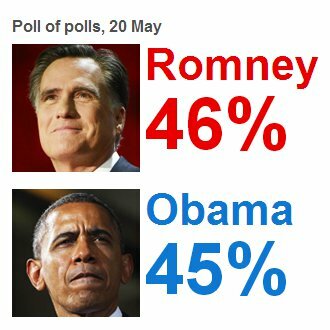 The US elections were fast approaching, but polls were showing it to be a very close race. This was going to be the biggest news story of the year though, so he HAD to predict something. He couldn’t possibly miss this opportunity to show off his prophetic prowess to the world. What is he to do? If he guesses one outcome over the other he might get it wrong, then he will have no video to release. It will be too high profile an event to do a video editing hatchet job like he’s often done before. In this case, whatever he says – people will remember and hold him to it. It’s just too close a call. How can he possibly get out of this one? Unless…. Yes. That might work. It may be too close an election to guess the outcome, but one thing is certain – it will be a very close election! The polls have made that quite clear. So that’s what he did. He predicted the “battle would be very, very close” *. * He may have waffled on about a few other issues as well, but the only prediction related to the outcome of the election was that it will be a close battle. God speaks through Emmanuel TV! President Bingu wa Mutharika is dead. Did TB Joshua predict this? Since the recent death of Malawi’s President Bingu wa Mutharika, the internet has been alive with claims that TB Joshua predicted it. The claims referred to a prophecy which TB Joshua gave during a live service on Sunday 5th February 2012. Numerous rumours were circulated about the time period of the prophecy; many believed he said this head of state would die within 60 days. SCOAN denied that there was any timescale given with the prophecy, which I expect they are regretting now since Mutharika died precisely 60 days later. In this article, we aim to cut through the hysteria surrounding this prophecy to look more closely at the facts and the context. Mutharika has had ill health for a long time, so much so that he was even rumoured to be dead a year ago. Despite popular rumours, TB Joshua did not predict the time frame. Any time up to a year of the prophecy could have fitted. Mutharika was 78 years old. If we were mathematicians we’d be able to calculate the probability of an ill, 78 year old, Malawian male dying within the next year (if anyone is clever enough to do this, please let us know!). If you were to calculate this probability for all heads of state potentially fitting TB Joshua’s prediction, the probability of one of them dying is almost certain. SCOAN clearly stated that TB Joshua “did not say that the prophecy was unchangeable”. Again making this is a win/win prophecy – if it happens he’s a true prophet, if it doesn’t he saved the presidents life. TB Joshua never named the country or the president to allow for specific prayer or support to be given. Why didn’t he name names even when he said he would? Did the death come sooner than God told him? Did he not even know the name at all? Secondly, the questions should be asked about how much TB Joshua already knew about Mutharika’s state of health. His Vice President Joyce Banda has very publicly expressed her support for TB Joshua in the past and regularly worships at SCOAN in Lagos. She said she visits the church “just the way some Christians visit Israel, or Muslims visit Mecca”, a comment which tells us a lot about how she views TB Joshua. It’s not beyond the realm of possibility that TB Joshua had some insider information that Mutharika was already on his death bed. Despite being constitutionally placed to succeed him, Banda was not on the best of terms with Mutharika after falling out with him in 2011 and being expelled from the party, leading some to speculate an even more sinister connection than this, but we’ll leave the conspiracy theories to others. Finally, the bible makes clear that even if a prophecy seems accurate, this does not mean it was necessarily from God. The accuracy of a prophetic word is only one factor to consider when weighing the legitimacy of a prophet (which lest we forget, all Christians have a responsibility to do). So again we must ask the question: What purpose did this prophecy have? Was his death prevented? No. Did he name the country or president, so specific prayer and support could be given? No (although he said he would). Did this bring glory to God? No. Did this bring glory and fame to TB Joshua? Yes. “(This prophecy) is unbiblical. There is no biblical precedence to that prophecy. God’s character is not given to inciting or causing confusion, despondency, apprehension or fear in individuals or nations. In the Bible, when a prophet is given a message regarding an individual’s ill health, death or demise of a leader, whether it is a good leader or bad leader, the prophet is given specific instructions to approach the particular leader and speak directly in the presence of some witnesses. Did TB Joshua predict the worldwide protests?